The purpose of scientific computing is the derivation, analysis and intensive use of new and efficient algorithms for numerical simulation in various domains of application. 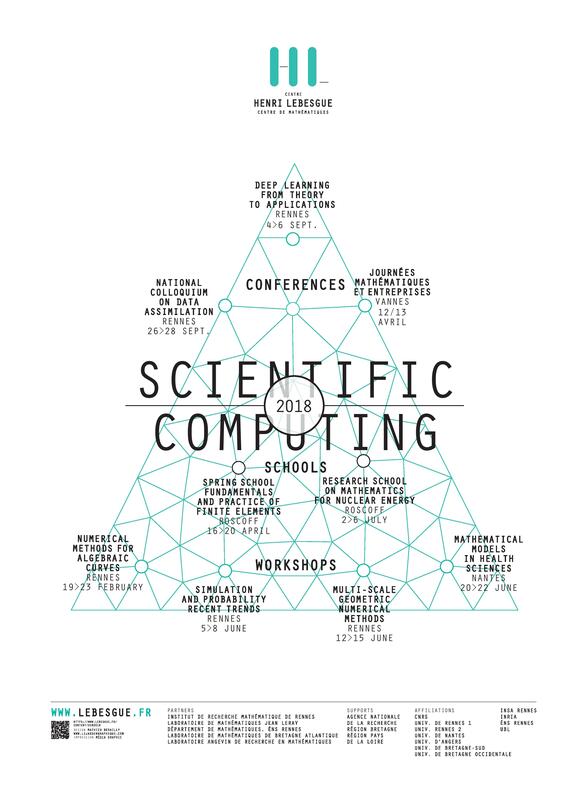 The formidable increase of computing power in the new electronic devices raised the important role of scientific computing in many scientific fields. From computer science to new technologies, from numerical simulations in physics to industrial high performance computing, there is a strong need of analysis and mathematics in this emerging field. The role of mathematics is central, and concerns all its specialities, from geometry to numerical analysis, probability theory or statistics. The semester organized by the Centre Henri Lebesgue aims at englightening this diversity. The foreseen events tackle many different subjects: Simulation of algebraic curves, probabilistic methods, numerical methods for kinetic equations, mathematics in health science, data assimilation and deep learning. Math and business days are also scheduled as well as two schools intended for young researchers. Scientific board: Eric Blayo (UGA, LJK Grenoble), Marc Bocquet (École des Ponts), Ronan Fablet (IMT Atlantique -Telecom Bretagne), Serge Gratton (ENSEEIHT ), Dominique Heitz (IRSTEA Rennes), Yann Michel (Météo France), Etienne Mémin (INRIA Rennes, IRMAR), Arthur Vidard (INRIA, LJK Grenoble), Pierre Tandeo (Imt Atlantique -Telecom Bretagne). Organization board: Frédéric Cérou, Mathias Rousset, Fabien Panloup. Scientific board: Frédéric Cérou, Mathias Rousset, Fabien Panloup, Tony Lelièvre, Bernard Delyon.